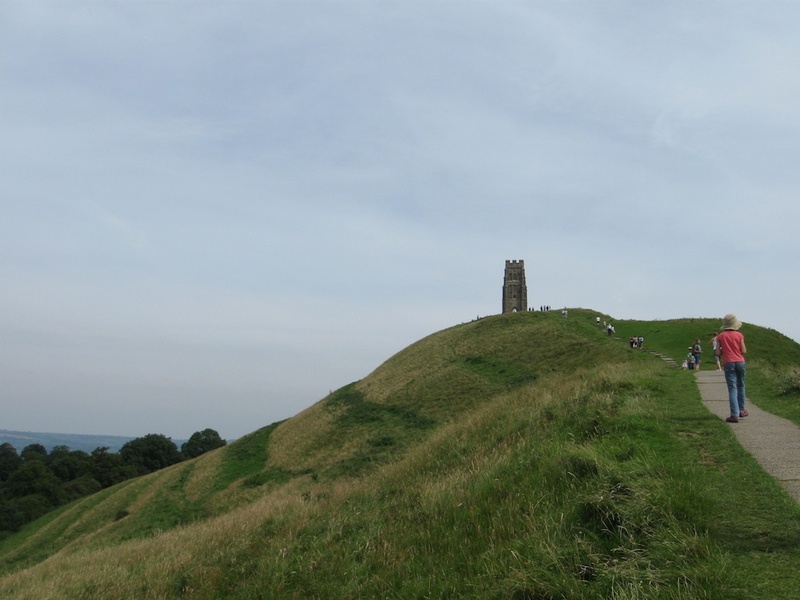 We recently took a drive and went exploring in Somerset where we enjoyed some absolutely gorgeous views. We stopped off in Glastonbury to see the sights and ended up spending the entire day there. What a neat town it turned out to be! 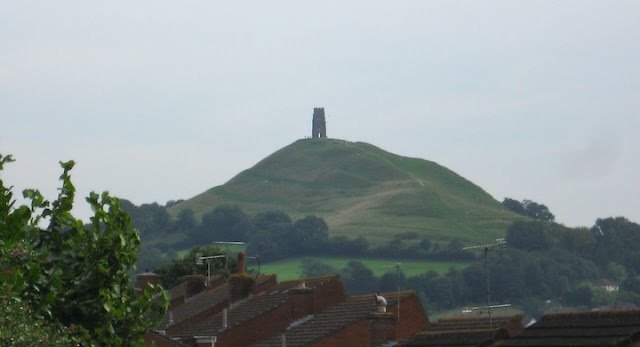 Aside from being the rumored burial site of King Arthur, my knowledge of Glastonbury was nil. As it turns out, it's a hippie town. It was like some strange English version of Moab, Utah and Eugene, Oregon rolled into one. Oddly, we felt right at home-- except when we walked into the nudist healing well: darkness, candles, water, flesh... but that's another story altogether. Otherwise, the alternative shops and music and veggie restaurants held such a familiar quality. I will readily admit that we nearly cried at the offerings in their large healthfood store-- by far the best I've seen yet in Great Britain. The kids were more interested in climbing up the hill to see Glastonbury Tor than seeing the abbey ruins. So after browsing around the town, we set out to find our way to the hill. And then we climbed up, up, up to the very top. It's considerably flat where we live in England. Flat and green. We see a lot of trees, and only once in awhile when we're out taking a drive in the country do we get a glimpse of a view. Like when we lived in Texas and Indiana, the lack of a view is something we've had to resign ourselves to, but of course we still have that longing to see off into the distance. There's something magical that happens when you can look out over the land and take it all in. You really get a sense of where you are in the world. Time and space all come together and it just lifts you and transforms you in that moment. So imagine my delight climbing this hill. Halfway up, the view was splendid. All the way up? At the very tip top of the hill, high enough for the wind to catch us in its grasp, it was ridiculously amazing. We could see everything. Far, far off in every direction. I can see for miles and miles and miles and miles and miles... oh yeah! Now that I've managed to reference a song from The Who, courtesy of the soundtrack of my childhood, I'll let you in on a little secret. I'm turning 40 this week. If I were to stand on the hill of my life, presumably, I would be somewhere in the middle. Far off in the distance behind me, I can see glimpses of my former self eating mud pies and skipping rope and kissing boys. And if I look ahead, of course I can't see a thing. What's to come is still in the shadows. It's a mere haze of ideas of what life might hold, but I can't get a real sense of it. We never can. I think that's why we're so pulled in by these places that give us such a vantage point over the landscape. It's the only time we can really see what's off in the distance... where we've been, where we are now, and where we're going. My life has been filled with so much change and upheaval, I can't say where I'll be three years from now, much less forty. I'm pretty sure it won't be naked in Glastonbury in a crypt full of candles and water, but honestly... how would I know? So I appreciate the view where I can get it. I may not be able to see off into the distance of my life and get a sense of what's to come, but if I'm still skipping rope and kissing boys... perhaps I haven't yet crested the summit. Perhaps I'm still on my way up. I'm so thankful to have these lovelies along for the ride. So where do you go for a view? Where do time and space collide for you? 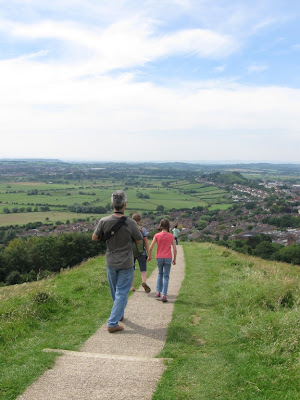 Derbyshire - the Peak District - it's so very beautiful and full of hills! Also, if you haven't been before, visit the Yorkshire Moors when the heather is flowering - simply stunning. I cried when I saw it for the first time last year - yes, I only saw it for the first time last year when we drove up to Whitby - so very, very beautiful! Thanks for the tips, Nikki. Those are two places we managed to drive right past on our travels, so we will definitely have to make plans to see them! Happy Birthday, Sara! Life begins at 40! Hm, I don't know if that is true, what Cathy says, I've had a major health crises when I turned 40 and have never recovered from that. However, I do wish you a very happy birthday without any major health or other problems!!! The view is splendid, it reminds me a lot of my school years in Northern Germany. It's very flat there also, even fewer trees, but every hill is a wonderful look-out spot! By the way, I loved your last blog entry, reminded me of one of my brothers, who played some pretend game with his friend that made them jump down from our garage: of course he twisted his ankle!! I'm giggling at the story of your brother. My brother used to do that too, only backwards and into the swimming pool. I guess some of them just have to learn the hard way, no matter how much we try to convince them otherwise. Happy 40th birthday, dear Sara! Cathy's right: life begins at 40. ;) Hubby's turning 50 this year and I'm only 2 years behind. Makes me nostalgic for 40. You haven't seen views in Indiana? You've not been up on our hilltop then! ;) Someone one said to us that our hilltop has the best view in all of Monroe County. For "real" views, though, we go to mountains in Vancouver.